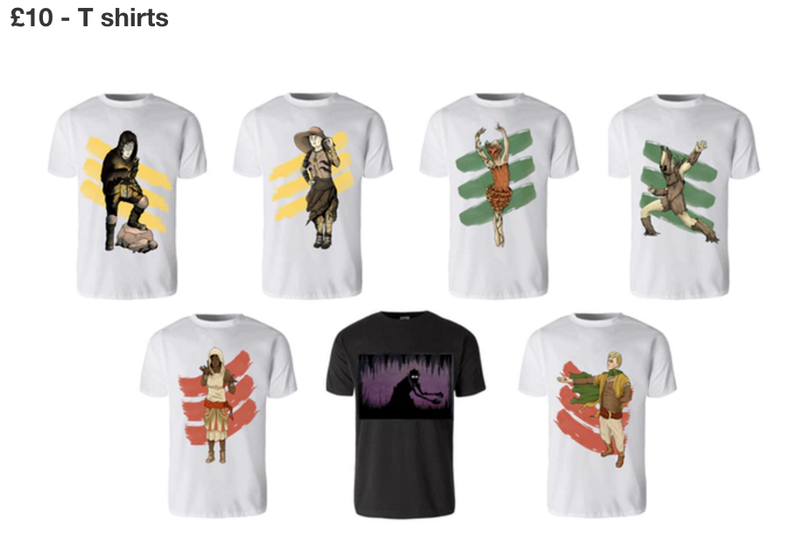 Why are there all these people that I have never heard of with kick starters? Return with us to the days of the fantasy heartbreaker! 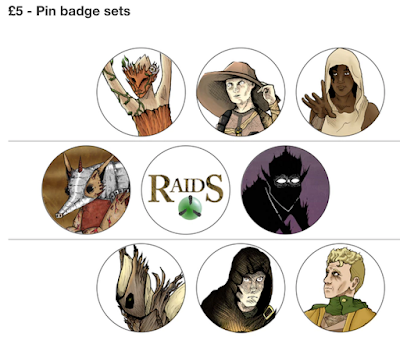 Isn't technically the whole OSR a return to the fantasy heartbreaker? Most of them are technically "fixed" versions of D&D, like Blueholme is not identical to Holmes edition, but hews close to it, S&W is not, in any of its incarnations, a reissue of the LBB, but hews close to it, etc. I think this product addresses people who know primarily computer games, and almost all of these use levels and such. Simply for the sheer satisfaction of hitting a level up button about once per day of gaming. So, the game might not be terribly different from a lot of published RPGs, but that has nobody stopped from publishing (and funding) more games, including an endless deluge of OSR games that nobody here seems to have a problem with. So, what are "we" actually picking on here? That author is not "a known" and hence cannot count on "the community" which only sees it fit to make fun of people that try to publish an indie? 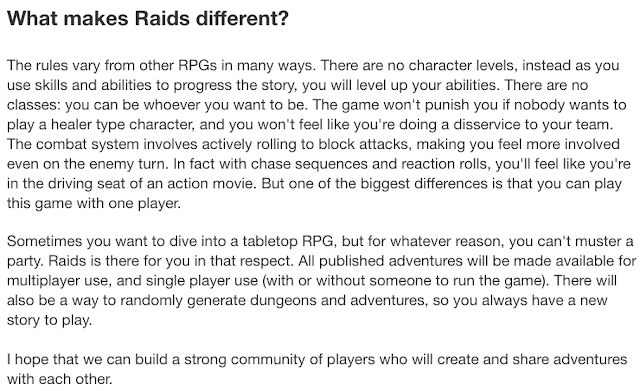 Or that the author of that KS is maybe not a multi-decade jaded veteran of RPGing, and hence hasn't seen it all yet? But yes, let's troll a person who has done nothing wrong _at all_. I think the idea would be that, in a case where the author of the work is lacking in experience, that he might want to consider that when writing up his proposal. If he said, "I'm no authority on RPGs, but this is something different from D&D or computer games and you might like it for that reason," I think that would go a long way toward contextualizing what he is doing. But when you are proposing a product and you demonstrate what seems to be a lack of general knowledge on your own target (both product and audience) it can be concerning. Personally, I'm turned off by the art and don't even need to read the text. Buuuut I'm shallow that way. 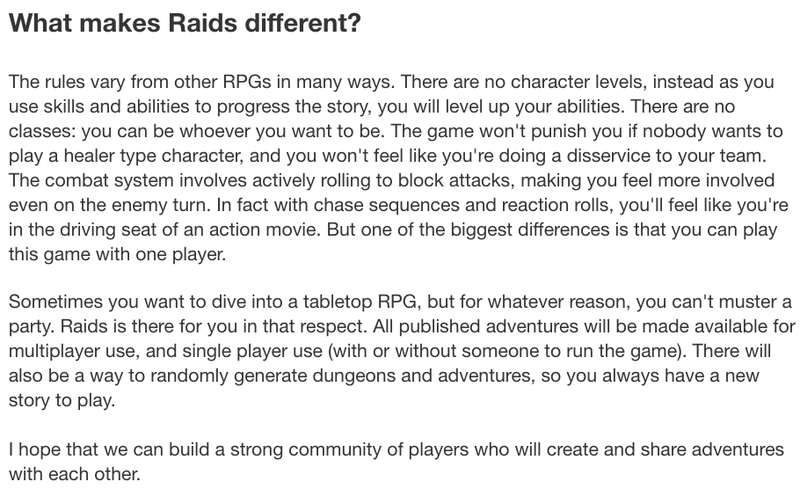 The name "Raids" brings to mind World of Warcraft, not what I would associate with the title "storytelling rpg"